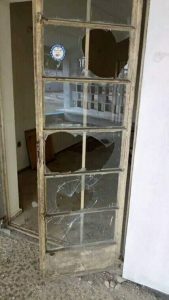 A new parralel secretariat of the All Progressives Congress, APC scheduled for commissioning today in Rivers State has been destroyed by unknown persons. The new secretariat positioned opposite Areta Farm Estate on the ever busy Aba Road axis of Portharcourt, was to serve as the operational base of APC members loyal to the Senator representing Rivers South-East, Senator Magnus Abe. The Abe Group who are in court challenging the ward, local and state congresses held by the APC in Rivers State had taken the new action to set up its own state secretariat. This planned move was however condemned by Hon.Ojukaye Flag Amachree who is the current Chairman of the APC in Rivers State. 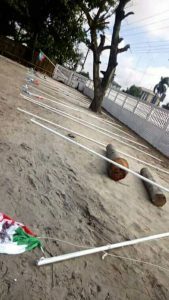 Suanu’s Blog recalls that Hon.Ojukaye had vowed to seal-off and pull down the structure on Thursday. 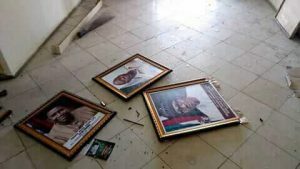 A report reaching Suanu’s Blog indicate that some thugs alleged to be loyal to Hon.Amachree stormed the factional secretariat, pulled down the APC flags outside and destroyed some fittings in the building in the early hours of Saturday. The Rivers State Chapter of the APC has been engrossed in crises with members divided in loyalty between Transportation Minister, Chibuike Rotimi Amaechi and Senator Abe who is a governorship aspirant under the APC.